We still haven’t heard from one of the winners, @cryptonaut101. He/she will have until the end of Monday to get in touch with us! By Tuesday, we’ll be announcing a new winner. Hi all - just managed to log in frrom hotel lobby - Interweb is incredibly slow here and eeps dropping out - so just thought i’d say hi and will respond to some of your replies etc - either now, if it holds up, or ehrn I get back if not ! We still have not heard back from the TL0 winner, @cryptonaut101, so we went ahead and tried to select a new TL0 winner. Unfortunately, there weren’t enough qualified entries. A lot of the TL0 members who joined the giveaway either didn’t have enough entries or didn’t update their profile photos - or in a lot of cases, both. We decided to move on to the next TL tier (TL1) and select a winner from that pool. Not to worry as the winner will still get the appropriate prize: a $25 Amazon e-gift card! 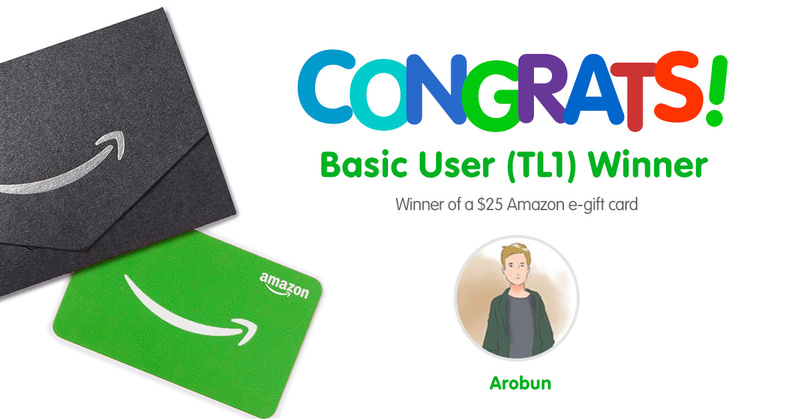 The new TL1 winner (who has since moved on to TL2 after the giveaway) is @Arobun! Congratulations, @Arobun! Please send me a DM with your preferred email address so we can send you your prize!!! Thank you for this prize. I’m glad that I found this beautiful community filled with and surrounded by amazing people. Is it alright to say “I love y’all”? Yas! Glad you now have your prize @Arobun! Congrats again! All right everyone, this officially ends our giveaway! Remember to check updates if you’ve won a giveaway next time! Oh and to follow the instructions ha. Thanks again to everyone who participated in this giveaway and also to those who were actively posting on this thread. You guys have all been wonderful. A new giveaway is in the works! Maybe. You’ll soon find out! Wow! Now I’m totally looking forward for another winner.